Doorstop Dash is the second level in Donkey Kong Country 3: Dixie Kong's Double Trouble! It is also the second area in Lake Orangatanga. 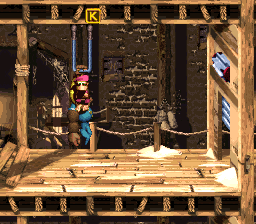 During this mill level, the Kongs find several doorways blocking their path. In order to open these doorways, they must pull nearby levers to lift them. The longer the lever is held down, the wider the door will open. Unfortunately, the doors only stay open for a limited amount of time, so they have to run through the level's other obstacles to get through them quickly. This level debuts Buzzes, who act as obstacles between levers and doors, and also includes many Sneeks. At the beginning of the level, the Kongs approach a Banana Bunch as they walk down a slanted bridge, which is followed by a lever that hangs above the letter K. If they pull the lever, they can open a doorway ahead of them that leads to a Sneek, a DK Barrel, and another lever. Once they pull the lever, a door blocking their path, found after a trail of restless Sneeks, opens, allowing them to access another area, where they can find a Bear Coin hidden in the top-left corner of the room. After the apes climb up a small ledge near here, they encounter an additional Sneek and a lever, which can be used to open a door on the above floor. Using a small, wooden platform floating nearby against a wall, they can reach this higher section of the level and find the door, which stands next to the letter O and a trapdoor that can drop the heroes to the lower floor. If they manage to run through this door, they find another Sneek that creeps under a lever that they can pull to open a door ahead. As they approach this door, they must dodge a trio of Buzzes that move back and forth in a vertical path. Once they reach the other side of this door, they can find a rope leading to the third floor and a passage that takes them west to a Bonus Barrel. The barrel is blocked off by a door, which the heroes can open if they pull a lever, which can only be reached by their Team-up move. After climbing the previously-mentioned rope, the heroes access the third floor, where there is a lever that can open a nearby door, which is placed after a line of six Buzzes that move back and forth in a vertical path. On the other side of this door, they can find a lever in front of the Star Barrel. The Kongs ride to the fourth floor. After they pull the lever, a door on the above floor opens. They can use a nearby platform to lift them to the floor, where there is a DK Barrel and a Sneek, who walks over a trapdoor that can drop the heroes down to the third floor. After they race through the door near here, they can find a Barrel Cannon that rotates when they enter it. It can blast them to a higher lever that must be pulled to open a door on a nearby ledge. On the other side of this door, the primates can find a pathway with a rope at the end of it. As they climb the rope, they encounter a Buzz that moves back and forth in a horizontal path. At the top of the rope, they can find a passage to their left and another to their right; the left passage leads to a lever, guarded by a Buzz, that can open a door with a Bonus Barrel on the other side of it, and the passage to the right takes the apes farther into the level, where they can find a Sneek, along with a Bear Coin, on a pile of bags. A lever hangs near here that they can pull to open a door on the fifth floor of the mill, which they can reach with the aid of a rope. As they climb up this rope, a Buzz flies in their way. Once they reach the top of the rope, they can find a Banana Bunch, a trapdoor, leading to the lower floor, and the door that they have recently opened. After they pass this door, they discover the letter N, a Sneek, and a pair of Barrel Cannons that must be used to reach a lever in a high, thin passage. A nearby door opens after they pull the level, and on the other side of it, they can find another lever and a rope that is guarded by a Buzz. When they pull the mechanism, a door on a higher floor, which they can reach with the rope, opens. The letter G sits immediately before this door, which is followed by a ledge and another lever that a Buzz hovers under. They can open a door ahead of here by pulling the lever. The two apes can find a deep abyss on the opposite side of the door, which trail of bananas run through. They must jump into the gap to fall to the lowest level of the mill, where they can find the Level Flag. Additionally, as they travel through the gap, they can find a ledge near the left that they can land on to access an area with a Steel Keg, which is behind a door, and the level's Koin. Right before the first Bonus Barrel. It is hidden right before the second rope. Hidden near the end of the level. Kiddy must stand on the edge of the platform (before the Level Flag) and throw Dixie at an up-right angle. Near the end of the level, at the fall to the bottom of the mill. The first Bonus Barrel is located to the left of the first rope in the level. In order to get to it, the player must have Dixie throw Kiddy upwards so they can reach a lever above them. Here, the player can simply jump and spin to the area containing a Bonus Barrel and a red Extra Life Balloon. The Bonus Level involves collecting sixty stars in under thirty seconds. They have to use levers to open a door and collect some of the stars. Once all of the stars are collected, a Bonus Coin appears. The second Bonus Barrel is to the right of the second rope encountered. The Kongs have to hang onto a lever again to open another door, although they also have to dodge a Buzz that is flying back and forth. 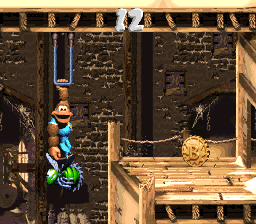 In the Bonus Level, the Kongs have to dodge two Buzzes, who fly around as the monkeys hang onto several levers. At the end of the stage, they can find another Bonus Coin. A rope leads to this letter before the last two doors. 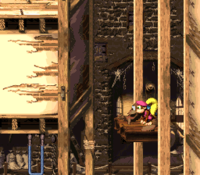 Just before the Level Flag, the Kongs have to jump off of a ledge and fall back to the bottom of the mill. As they fall, they should stay on the left side of the wall and eventually land in a hidden area. In this area, they can find a Koin near a Steel Keg. The Kongs have to pull the above lever to open a door above the Koin. After throwing the Steel Keg into the open door, the Kongs should stay in place and watch it bounce against a wall into the Koin. After reaching the second floor of the mill, Kiddy Kong should use the Team-up move to toss Dixie northeast into the corner of the area, where a Warp Barrel is hidden. The barrel takes them to the Level Flag when they enter it. Artwork of the Kongs in Doorstop Dash. 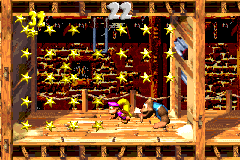 The Kongs begin the level in the original version of the game. Dixie pulls a lever, opening a door. Dixie runs through a doorway. Kiddy tosses Dixie to a Bear Coin. The Kongs near the first Bonus Barrel. Dixie holds Kiddy on her shoulders as they approach a Bonus Barrel. The Kongs pull a lever. Kiddy walks underneath a Sneek and a Bear Coin. Kiddy collects the letter N.
This page was last edited on April 6, 2019, at 12:59.